The chook. More exotic than you know – they are the domesticated descendants of wild junglefowl from Asia. More powerful than you know. They are perhaps the most successful species of bird, by numbers, that have ever lived. There are now an estimated 24 billion of them. Why is the chicken so popular? And what can they do for our backyard? It’s not just about producing better tasting and cheaper eggs than you can possibly buy (but they do that too). Even if you already have chooks, it’s good to think about all the benefits they provide. There are lots of reasons to bring some chooks into your life. 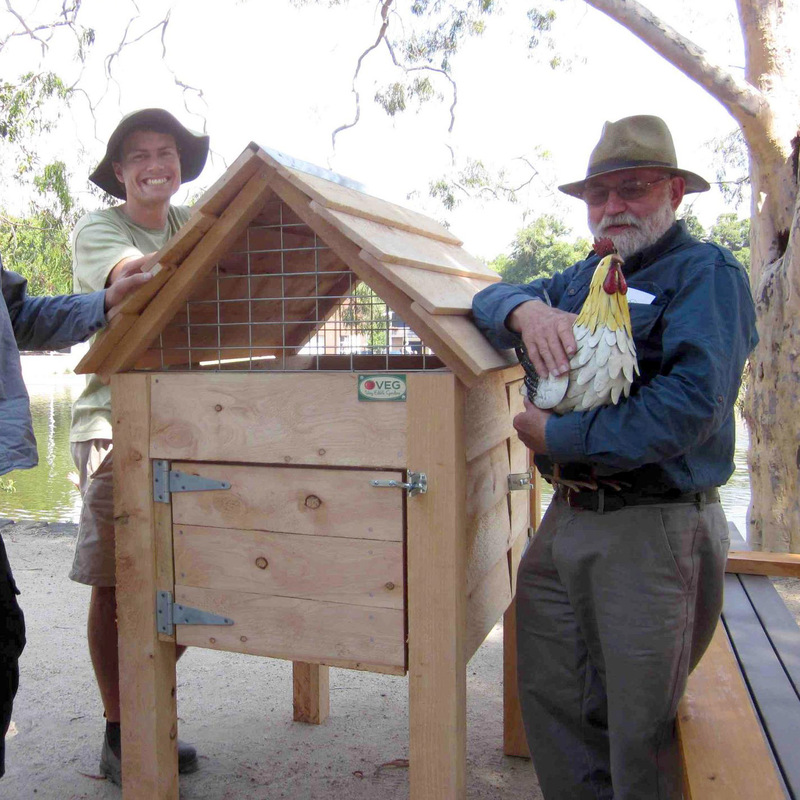 A VEG chook house. They only sleep and lay eggs in here so it doesn’t need to be big. 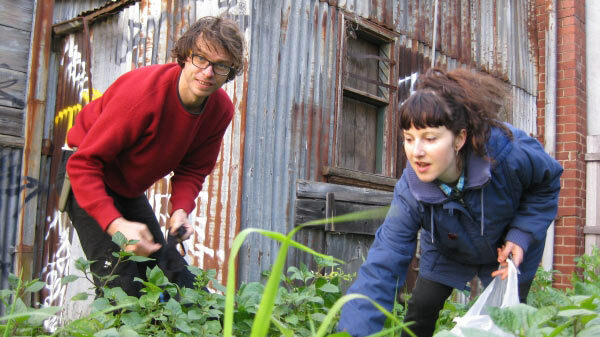 Want to make your chooks happier, and have them go to work making great compost for you? Want to be able to go away for weekends knowing they’ll be safe? 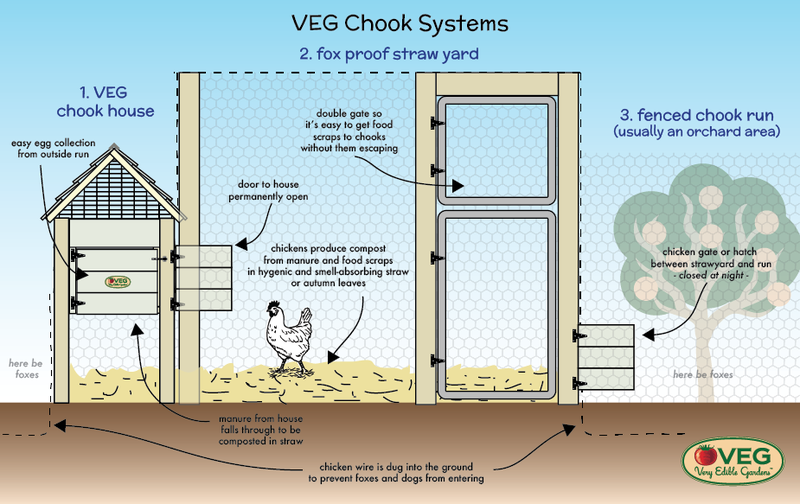 A fox proof straw yard is your (and your chooks’) best friend. It is a fully enclosed small run adjoining the chook house (meaning you can go away for a few days and the chooks can let themselves out into this safe outdoor space). In the strawyard the chooks will happily work to generate rich organic compost by removing seeds and insects from leaves etc. then manuring and scratching and turning the material, until it is chocolaty brown and ready for collection and use. You can throw food scraps including meat scraps directly into the straw yard for the chickens to process (but only as much they can eat or scratch in within a day to avoid rodents). It is important to keep a 20-40cm thick layer of straw, hay, dry leaves, wood chips or similar in the straw yard at all times, to be periodically harvested for use in the garden. The straw yard can potentially become your main composting system and remove the need for extra compost bins. The straw yard should be fox proof, requiring you to lay a 40cm flange of mesh coming off the main fence at 90 degrees about 10 cm below the ground. You should completely cover the roof of the straw yard with chicken wire to make it 100% fox proof. A VEG chook house and strawyard. Eggs are easily collected without opening a gate. Food scraps are easily thrown into the strawyard with the double gate. Chooks need room to move about, and ideally need a large run broken up into several separately gated sections. Fences should be at least 1.4m high. This area usually doesn’t need to be fox proof, as the chooks are only out in their run during the day. At night your job is to shut them into the fox-proof house and strawyard areas. VEG offers tried and tested chook runs here. Often the run includes fruit trees. The chooks will gladly keep down grass, weeds, pests, while fertilise the fruit trees. They will enjoy the shade, shelter and fallen fruit as part of the deal. It’s a great deal all round! Around homes, it is worth being aware that the soils may contain lead or other heavy metals or residual pesticides. If you can’t maintain a grass cover (which usually means multiple runs, well managed) we recommend a deep layer of woody mulch to minimise the chooks contact with the original soil. Consider a chook ‘tractor’, ie. a mobile pen without a floor. This can be moved around the garden allowing the chooks to scratch the ground and eat weeds or leftover veggies, while spreading their droppings. This should be done about two weeks before you want to plant out this area. It can be cruel to keep chickens in a small place for a long time, so we generally recommend chook tractors as temporary and not permanent homes. However, if you are dedicated to moving them regularly it can work. If you want to know more about a whole system of veggie gardening based around light weight movable chicken tractor domes, check out Linda Woodrow’s The Permaculture Home Garden. There’s guidance on other chook tractor designs in Harvey Ussery’s excellent The Small Scale Poultry Flock. Greens – grass, spinach, parsley, carrot tops, cabbage leaves (tie up in bunch and fasten to the side of the chook run). Or grow a ‘green manure crop’ that will condition your soil + provide green pick for your chooks. Don’t feed them: avocado, chocolate, green potatoes, rhubarb. For recipes to make your own chook food see Alanna Moore’s Backyard Poultry – Naturally or Harvey Ussery’s The Small Scale Poultry Flock. Water: Always have fresh water available. Keep the container out of the sun otherwise the water will become too hot for the chooks to drink. On super-hot days you may need to add ice to the water or the chickens won’t drink it! Australorp – Australian, dual purpose. Large, handsome, black bird. Sussex – U.K. breed. Dual purpose. Suited to cool climates. Wyandotte – U.S. dual purpose. Friendly and cuddly looking. Pekins – a bantam breed, great for kids. Quiet, tame and low impact on the garden, so they can free range in more areas. … there are many more great breeds out there. Comfrey – Wonderful herb for your organic garden. Perennial, large green leaves, grows in sun or partial shade, plant from a root cutting. Chop up and feed to chooks regularly. Comfrey has a vigorous root system, so grow it away from your veggie patch. Nasturtium – Great for your chooks’ general health and it repels insect pests. Rue – Good chook medicine and insect repellent. 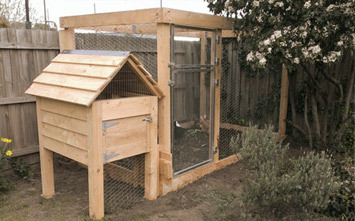 Dry and scatter through chook house to repel pests. Wear gloves when handling this herb as it can cause some skin irritation. Southernwood and Wormwood – Insect repellents and medicinal. Grow wormwood away from other plants as its roots inhibit growth. Good to dry and scatter through chook house. Regular garlic treatment is the most popular natural method. Place 1-2 cloves (per bird) of crushed garlic into your chooks drinking water, for several days in a row. Other methods – add a little apple cider vinegar to the drinking water or any of the following – nasturtium seeds, grated carrot, wormwood tips, mustard or pumpkin seeds. If your chicken has worms and needs urgent attention please visit a pet supplies centre to buy worming liquid. The Small Scale Poultry Flock, Harvey Ussery – By a far the best chook book we have seen and totally consistent with VEG’s approach to, and philosophy about, keeping chooks. 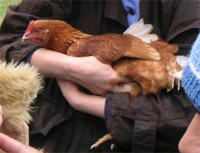 Courses: See the Upcoming Courses section for upcoming ‘Beginners Guide to Chickens’ courses.